It is always fun to look at before and afters, and the Acorn Cottage is no exception. Here is the living room on May 11, 2018. And here is the living room today, September 17. 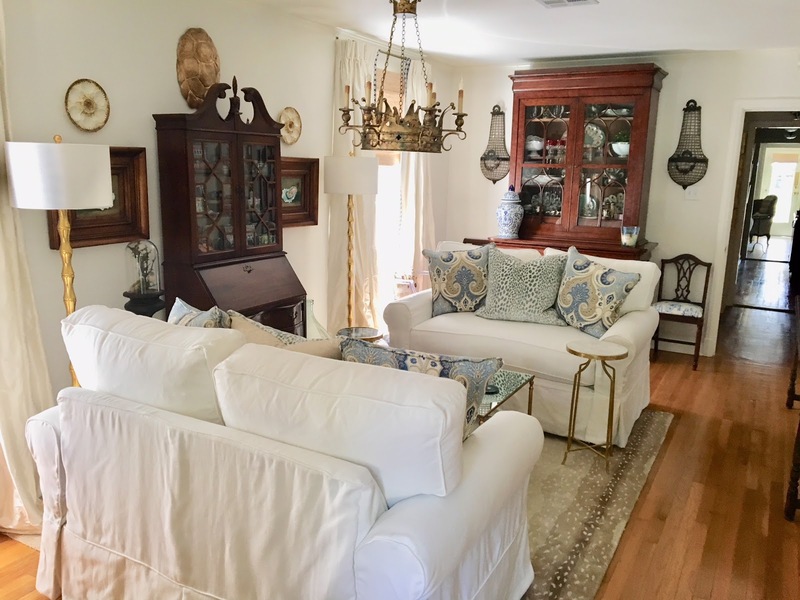 J and I were able to use some of our former pieces including the tiger-print chairs, secretary (DOP Antiques), crown chandelier (Currey and Co.), and sofa table (The Plantation Shop), but the majority of the pieces were new in order to fit the scale of the long, narrow room. 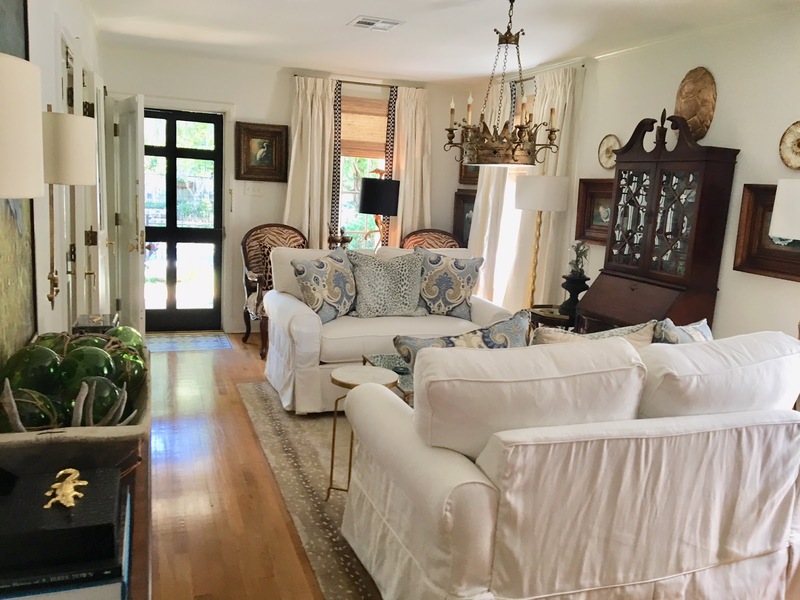 New loveseats were purchased at Niche Modern Home in Mandeville, LA as well as the brass and glass coffee table. An antique hutch was scored at DOP Antiques. If you have not been to DOP on Jefferson Hwy., you must get there. Their warehouse is filled with one-of-a-kind, must-have furniture and accessory pieces. The two sconces on either side the hutch were also DOP finds brought over from our previous home. The wall, trim, and ceiling colors is Benjamin Moore's white dove, one of my favorite whites. The rear of the front door was also painted white dove. The area rug is a new purchase from Ballard Designs. It is the antelope hand-tufted rug. 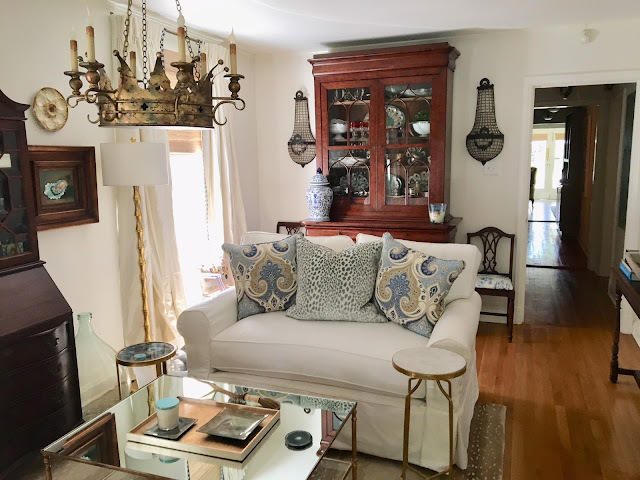 New floor lamps are from Wayfair. 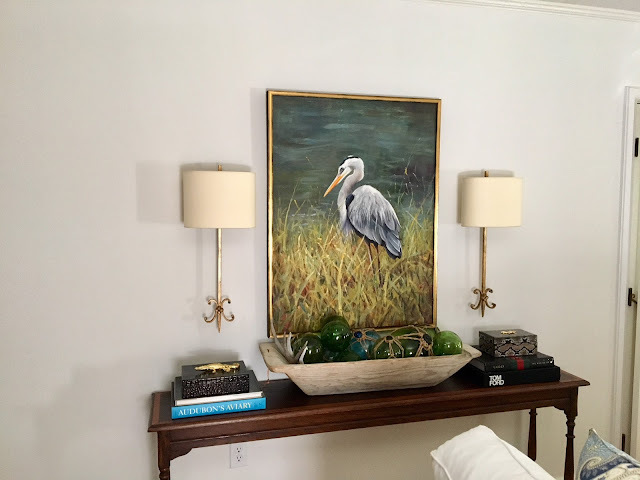 Oil paintings brought from our former house were purchased from Chic Chateau (Thibodaux) and Abode (Metairie). I am loving the softness of the new living room. This room has certainly 'grown up'! I love pulling couches/love seats away from the walls...one of my fav things to do <3. Keep the photos coming! Thanks. I love couches off the wall. Oh I love your new room. 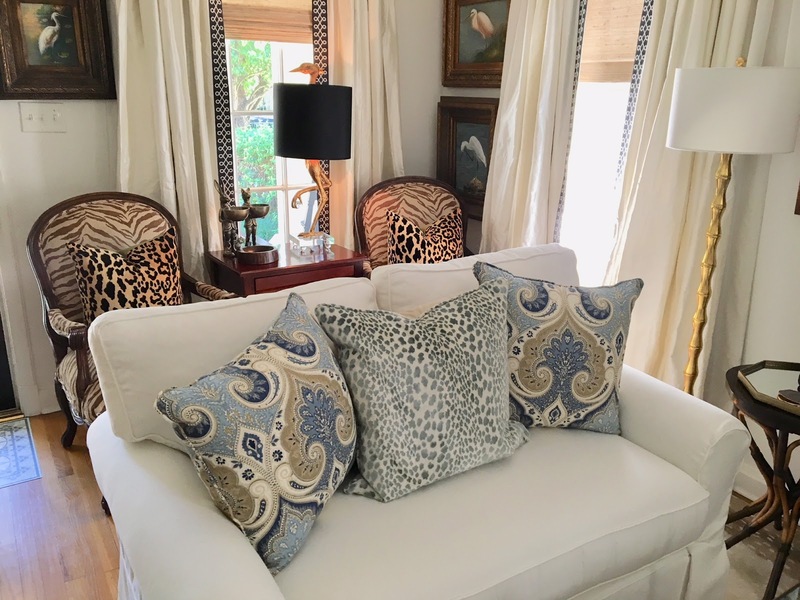 The soft white sofas and pretty prints in your pillows and chairs create such a beautiful and calming room. Gorgeous. 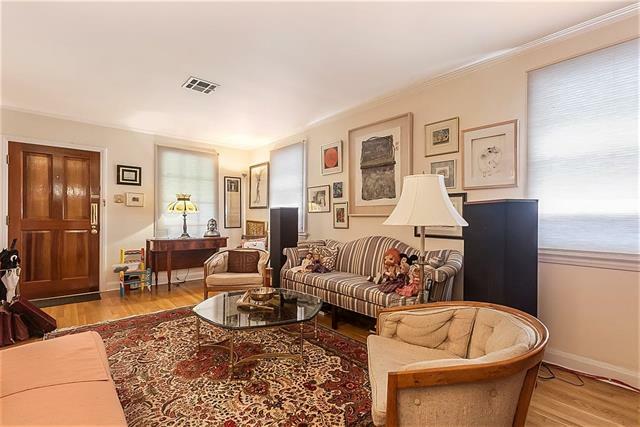 Ah, there is a peace and tranquillity to your design, compared to the wonderful hodgepodge of antiques and placement in the first photos. You gave the room some 'air' to breathe. Lovely! Wow, amazing before and after!! Love, love what you did! Ahhhhhh I am loving the before and afters now Ron. Oh that space is so gorgeous. I love the slipcovered love seats. Your tastes in this room are fabulous just fabulous. I love it all. That crown chandy is the best and such a whimsy beautiful piece in the room. Ron this is just so amazing. I seriously am loving that you and J are making this historic cottage so beautiful. Bravo sir you have done so great. Keep the before and afters coming. Your blog posts are like my favorite show. I cannot wait to see the next episode or in this case post!!!! Oh wow, Ron, refined and and rich! I love the black accents. I would hire you and trust all your suggestions in a minute! What a great transformation. I like the scale of the furnihshings and the textiles you’ve used. You’ve got a lot of seating in the living room and can accomodate a lot of friends when you gather! The front door is quite a piece- so wide and I love the screen/storm door you added. I like the porcelain urn setting on the outside of the cabinet doors- sharp! Keep it coming- we’re all loving this! Love looking at the befores and afters. I did a total remodel of my bathroom kitchen and dining room last year. Allot of work. Contractors worked from March to July. We were living in the house during renovation. Woo Nellie what an experience, but I absolutely love the results. 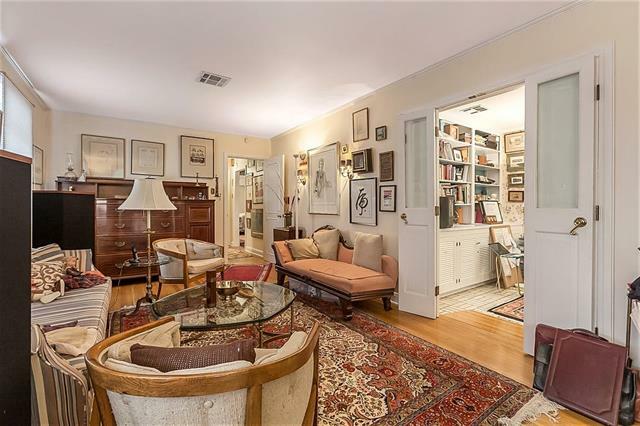 I have the same antelope rug from Ballard’s in my dining room with a smaller matching rug in the kitchen. I love it and get many many compliments. Congrats on your lovely new home. God bless you and J with many years of joy and peace there.